Sometimes the hardest part of scrapbooking is staring at a blank 12x12 piece of cardstock and deciding where to place and how to layer your embellishments. 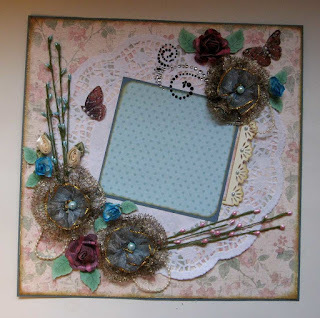 This vintage layout is elegant and so easy to make! In this written tutorial (sorry no videos on this one! ), I show you step-by-step how to create the vintage layout in the photo. This is one of my favourite vintage themed scrapbook pages that I designed and sold in my online shops in the past. The instructions include lots of photos that show how to layer and place papers and embellishments. You may use embellishments you already have in your stash. As you work through the instructions for this layout, I indicate measurements and also provide tips to help make things easy. And if you want to make the large beaded lace flowers shown in this layout, check out my tutorial at www.scrappinrabbit.com/2013/05/how-to-make-flowers-out-of-lace.html. Once you've completed this layout, you'll be able to make more in no time. Below are two more layouts I made based on the same tutorial. Feel free to ask questions or send me your comments. For more tutorials, visit www.scrappinrabbit.com/p/tutorials.html.